Last November, the National Complete Streets Coalition adopted a new and improved policy framework for grading Complete Streets policies. Our revamped Elements of a Complete Streets Policy raises the bar by calling for stronger commitments to equity and implementation. To celebrate the new framework, we’re highlighting some of the best Complete Streets initiatives, projects, and champions around the country in lieu of our annual Best Complete Streets Policies report. Between now and the release of the full report on March 21, we will profile one winning initiative each week. Last week’s featured profile was Las Cruces, New Mexico’s Downtown Master Plan. This week: VELO Bloomfield’s community engagement efforts around equity and Complete Streets in North Jersey. Photo courtesy of VELO Bloomfield. VELO Bloomfield has implemented three of the key implementation steps for Complete Streets initiatives. VELO Bloomfield was founded in 2016 by environmental biologist Dr. Charles Sontag and Lark Lo, who runs VELO’s daily operations. The name VELO comes from the French word for bicycle, vélo. VELO is funded by donations, community memberships, and the Partners for Health Foundation, which supports strategies to address unmet community needs among vulnerable populations. VELO connects people to information about how to reduce car dependence, and improve conditions for walking, biking, and using public transit in communities that have been historically underserved. America’s history of systemic discrimination and exclusion based on race and income extends to decisions made about transportation and cannot be ignored. Communities of color, especially African Americans, bore the brunt of discriminatory government policies that made funds for transportation improvements in their neighborhoods hard to receive; the effects are still being felt today. Reflecting this fact, The National Complete Streets Coalition defines equity in Complete Streets as intentionally prioritizing the communities that have been disproportionately impacted by past transportation policies and practices. In our new policy grading framework, jurisdictions are now required to include equity in Complete Streets policies and plans. Through gradual changes, educational campaigns for all people that use the road, and targeted outreach VELO is working to make streets, and the transportation system more broadly, safe, convenient, reliable, affordable, accessible—regardless of race, ethnicity, religion, income, gender identity, sexual orientation, immigration status, age, ability, languages spoken, or level of access to a personal vehicle. Since its launch in 2016, VELO has led several notable campaigns that have made streets in North Jersey safer for the people who rely on them to get around. VELO successfully advocated for a four-way stop sign at an intersection (Watsessing and Grove) that connects the walkable community of Halcyon Park to the New Jersey Transit Hudson-Bergen Light Rail. Prior to the stop sign installation, the intersection was more dangerous due to high-speed traffic and a large number people crossing to access the light rail and nearby schools. For years residents of Bloomfield advocating for safety improvements were told that it was a county road so nothing could be fixed. After an investigation, VELO discovered that the road was indeed under Bloomfield’s jurisdiction. 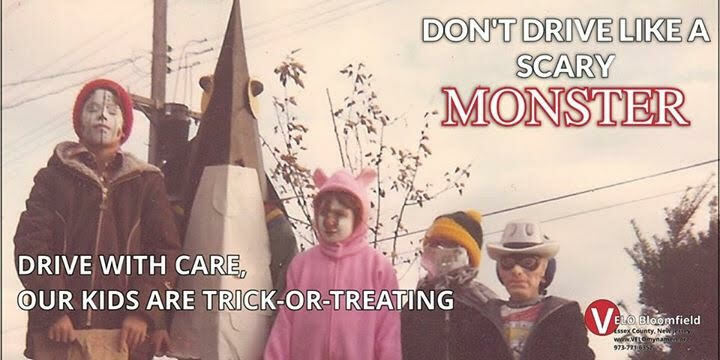 The “Don’t Drive Like a Scary Monster” campaign during Halloween put the onus on drivers instead of children in regards to safety during trick-or-treating, when the streets are filled with young children and parents walking. A few years ago Streetsblog also emphasized the importance of not shaming people who walk but instead placing responsibility first and foremost on those driving a two-ton motor vehicle. VELO also produced a pledge from North Jersey mayors and policymakers to spend the same amount on infrastructure in communities of color and working-class communities as spent on predominately white and middle-class communities. 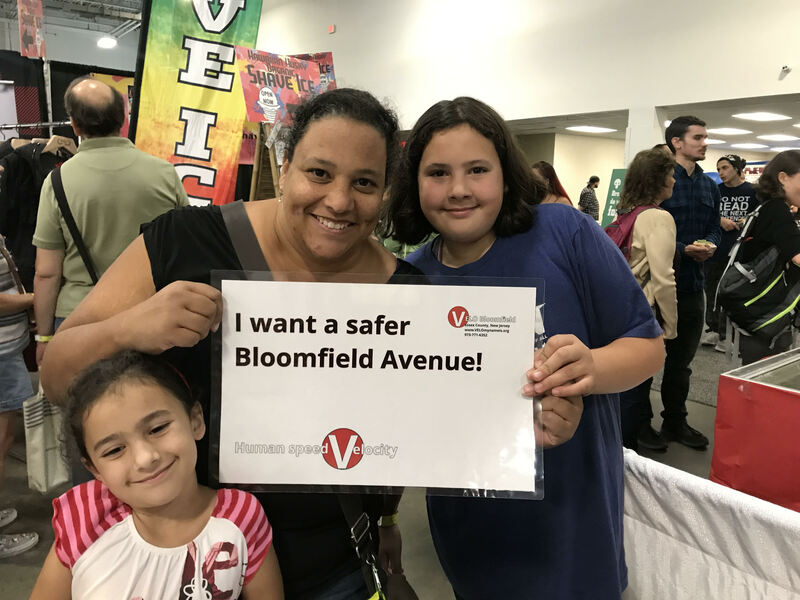 The blog for VELO Bloomfield has reached communities that have not traditionally been looped into urban planning conversations related to Complete Streets. Within the blog, VELO also created the Cycle Tracks zine, which encouraged people to write about their experiences not traveling in cars. “Don’t Drive Like a Scary Monster” campaign. 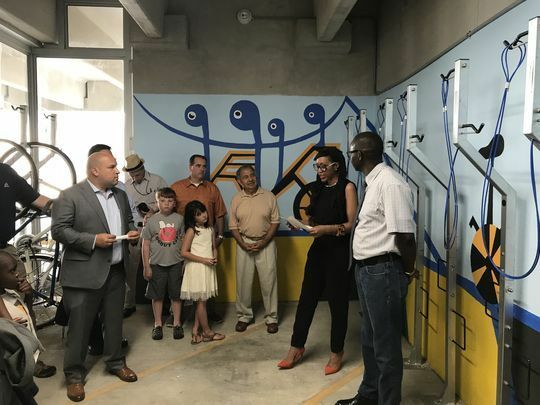 VELO also helped connect a local artist in Bloomfield to paint a mural at the town’s bike depot in collaboration with Bloomfield Parking Authority and the New Jersey Bike Walk Coalition. Papa Tall, the artist, moved to the United States from Senegal two decades ago and turned the depot’s previously blank walls into a message representing “love and family on the road.” Anyone who lives in Bloomfield can sign up for a membership with the bike depot which provides secure, covered bike storage. “Because of VELO people understand what Complete Streets are, we are educating the public on what TIGER Grants are, we also have brought the conversation of equity to the forefront of Essex County. Transportation is an equity issue. If you can’t walk home, if you can’t get to work, then your life choices are limited. Freedom of movement is the cornerstone of Civil Rights. Our work has made people from Montclair to Bloomfield to Newark ask questions like, ‘What is the pedestrian level of service?’ at urban planning meetings. We’ve elevated the conversation of transportation. While all changes are collaborative efforts via community, municipal, and county levels, our community is getting changes more quickly, such as making the intersection (Watsessing and Grove) safer. “What transportation advocates can learn from VELO is the community will champion Complete Streets and multi-modality if they know what it is. Equity is something that can be part of the conversation between planners and politicians if they know someone is paying attention and reporting on the issue. Speak in common language and make an effort to be engaging. VELO Bloomfield is breaking down the barriers to community engagement by making it accessible for people to get information that will affect their lives. Whether it’s signing a petition for a safer county road, posting the next open house meeting for the regional transportation plan, or co-hosting a workshop at the neighborhood bicycle depot, VELO is pursuing equitable Complete Streets and using innovative outreach strategies to do so.